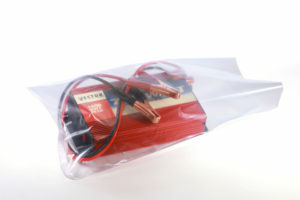 Maco Pkg offers eco-friendly plastic bags, also known as Smart Tech Bags. We deliver stock and custom orders of Smart Tech Bags to help product brand owners and entrepreneurs decrease the number of sources they must rely on for plastic bags. Source reduction is one of the healthiest choices you can make for the environment. Smart Tech Bags are manufactured completely in the USA with renewable energy sources like wind and solar power, avoiding pre-consumer waste. Helping to preserve the planet, these eco-friendly plastic bags are fully recyclable and non-toxic. What are Smart Tech Bags? Smart Tech Bags are manufactured with proprietary formulations in medium and large layflat and gusseted sizes. Compared to low-density polyethylene bags, Smart Tech Bags are three times as impact resistant and have double the tensile strength. Lighter in weight, Smart Tech Bags perform well at lower gauges, offering you the same level of confidence as in LDP. ISO registered, Smart Tech Bags follow stringent ISO 9001:2008 standards that guarantee top performance. Packaging manufacturers in the US are able to control performance and manage uniformity. By using renewable energy, what we like to call “smart power,” for every 13,000 Megawatt Hour (MWh) of traditional electricity that we eliminate from the manufacturing process, we avoid 18 million pounds of CO2 emissions. According to the U.S. Department of Energy, that equals 1,740 fewer cars on the road for one year. Using renewable energy to manufacture plastic bags is a competitive advantage for your brand. Consumers are intrigued by the concept of sustainable packaging and they’re interested in doing their part to preserve the environment. Sustainable packaging can introduce your brand to new opportunities as customers become more aware of the ecological impact of plastic waste and want to participate in the green initiative. Greenhouse Gases, composed of carbon dioxide, methane, ozone, fluorocarbons, and water vapor, absorb solar radiation and contribute to the greenhouse effect on the earth. Carbon Footprint is the amount of carbon emitted into the atmosphere by a company, person, country, etc. Sustainability, also known as the “green initiative,” is a division of environmental science that emphasizes preserving the earth’s natural resources and supporting long-term balance in the ecosystems. Renewable Energy, or “green energy,” is any inexhaustible sources of power usually derived from natural sources such as wind, sunlight/solar, hydroelectric, or geothermal heat. If you’re interested in learning more about eco-friendly plastic bags, contact us! We’d be happy to discuss feasibility, potential business return, and if Maco Pkg is the right source for your USA-made Smart Tech Bags.